MESQUITE, TX — April 15, 2017 — Jason “the Ragin’ Cajun” Johnson dominated night one of the Texas Outlaw Nationals at Devil’s Bowl Speedway, leading all 25 laps of the evening’s Feature after winning the Craftsman Club Dash from the pole and running fastest in qualifying. Johnson’s second win of the season leaves him fourth in points standings and finally puts a little distance between him and Daryn Pittman. It’s also his seventh career series victory, the first one having been at Texas Motor Speedway fourteen years ago. While Johnson led flag-to-flag, Brad Sweet was patiently working his Napa Auto Parts/ Kasey Kahne Racing No. 49 up from five to make a late-race push for the lead. Running the bottom, he made a pass for second over Jason Sides between turns three and four, but then chose to follow Johnson on the top and came in after him. Sides, who had been running second throughout the race, lost steam in the final laps and dropped back to eight, leaving the final podium spot to Logan Schuchart, who had been running in fourth. Meanwhile, it wasn’t a stellar day for the expected superstars on the field. NASCAR stars Tony Stewart and Kasey Kahne came in 22 and 11 respectively, both falling back two spots from their starting positions. And eight-time Series Champion Donny Schatz washed way up the track in the first half of lap one and never fully recovered. The previous night’s winner, David Gravel, managed to work his way up from the back, but it just wasn’t enough, leaving him in 14. But last year’s night one winner, Joey Saldana barely missed the podium with a fourth place finish. 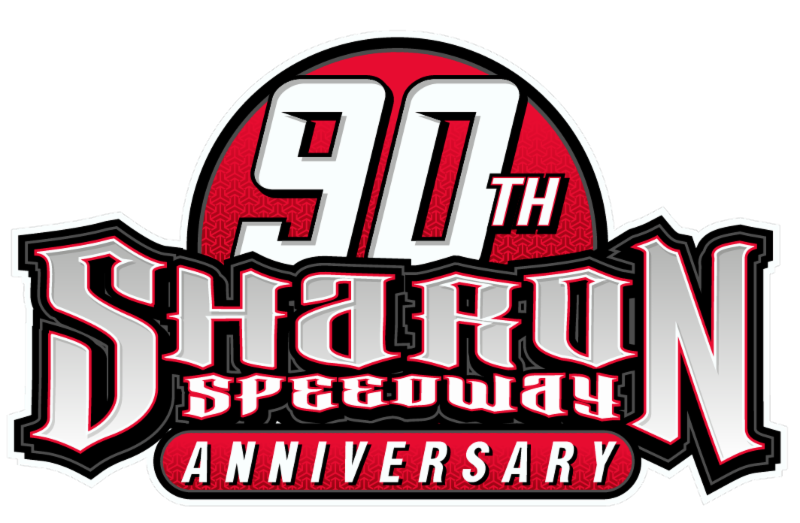 The World of Outlaws Craftsman Sprint Car Series will return to action tomorrow for the final night of the Texas Outlaw Nationals at Devil’s Bowl Speedway in Mesquite, TX. 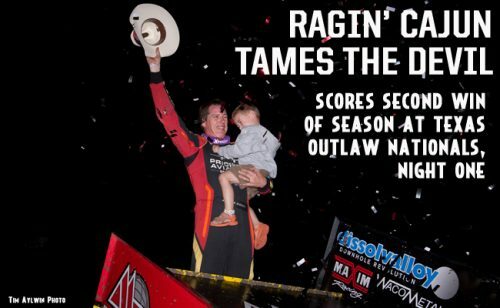 RACE NOTES: Jason “the Ragin’ Cajun” Johnson dominated night one of the Texas Outlaw Nationals at Devil’s Bowl Speedway, leading all 25 laps of the evening’s Feature after winning the Craftsman Club Dash from the pole and running fastest in qualifying. Following him into Victory Lane was Brad Sweet in the KKR 49 after a failed last-lap effort to steal first. Logan Schuchart in third. CONTINGENCY WINNERS: MSD Ignitions ($25 cash): Travis Rilat; MSD Ignitions ($50 cash): Jason Johnson; Penske Shocks ($50 cash): Brent Marks; JE Pistons ($50 cash): Karig Kinser; VP Racing Fuels ($50 cash): Jason Sides; Edelbrock ($50 cash): Brent Marks; Comp Cams ($50 cash): Brady Bacon; Cometic Gasket ($50 cash): Brady Bacon; Super Flow ($50 cash): David Gravel; Craftsman Club Fast Five ($100 cash): Jason Johnson, Jason Sides, Logan Schuchart, Brad Sweet, Joey Saldana; Craftsman/Sears: Christopher Bell; KSE Hard Charger: Kraig Kinser; Comp Cams ($50 product certificate): Jason Johnson; JE Pistons (Set of Rings): Sheldon Haudenschild; JE Pistons (Set of Rings): Jacob Allen. SEASON WINNERS: Donny Schatz – 6 (Volusia Speedway Park on Feb. 19, Volusia Speedway Park on Feb. 19, LoneStar Speedway on March 3, The Dirt Track at Las Vegas Motor Speedway on March 9, The Dirt Track at Las Vegas on March 10, Thunderbowl Raceway on March 18 ); David Gravel – 4 (Thunderbowl Raceway on March 17, Placerville Speedway on March 29, Perris Auto Speedway on April 1, Gator Motorplex on April 3); Jason Johnson – 2 (Volusia Speedway Park on Feb. 17, Devil’s Bowl Speedway on April 14); Brad Sweet – 1 (Stockton Dirt Track on March 25), Logan Schuchart – 1 (Keller Auto Speedway on March 31), Brian Brown – 1 (Cocopah Speedway on April 7), Rico Abreu – 1 (Arizona Speedway on April 8).